It will be a year this summer, Anishinabek Employment and Training Services (AETS) moved in and helped transform the lower level of the Waverley Library through a collaborative partnership with the Thunder Bay Public Library (TBPL). As an incorporated, not-for-profit organization, AETS continues to be part of a national network delivering an Indigenous Skills and Employment Training (ISET) federally funded program in the North Superior Region with nine member First Nations. The partnership with the TBPL has and continues to enable AETS to accommodate its growth to empower the Anishinabek, and at the same time support the TBPL in the decolonization of library space, relationship building and facilities renewal. Most of the facilities renewal including a shared open area with eight workstations, one boardroom, staff offices along with a variety of artwork (i.e. 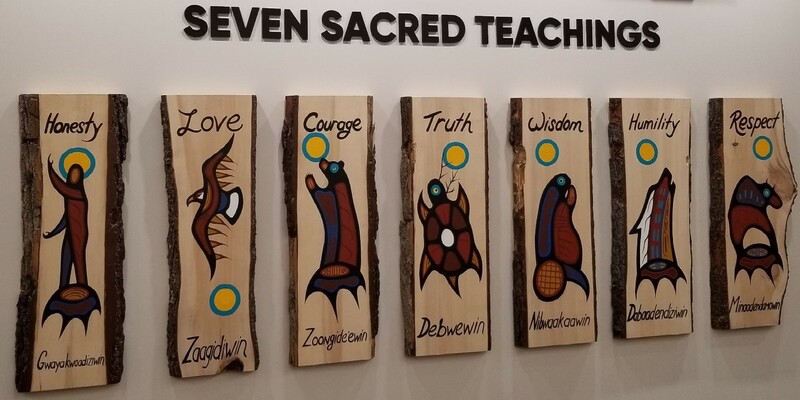 : see below Welcome Mural and the Seven Sacred Teachings) is now complete, with some internal and external signage expected to be done this summer. As a result of the partnership agreement with the TBPL, AETS worked together with the TBPL last summer to complete an application for an Enabling Accessibility Fund (EAF). Early in January 2019, funding was approved under the workplace accessibility stream of the EAF to renew the two current washrooms and add two more public and one more private washroom in the lower level of the Waverley. The washroom project will result in a more accessible and safe workplace, with renovation scheduled to begin early this summer. This is yet another example of how the TBPL with AETS, are together not only working on a social but physical infrastructure to build connection and inclusion in the community. On March 1st, AETS signed the Thunder Bay Anti-Racism and Inclusion Accord. As a member of the coalition, AETS is committing to report on successes by working together to address racism and discrimination in our community. AETS is also committing to support an ongoing process of truth and reconciliation. AETS is delivering a variety of training to employment services this coming year, which includes Sawmill Worker and Forest Mechanized Harvester Training as well as another cohort in Carpentry (Pre-Apprenticeship Training Program) and Personal Support Worker Training. AETS is also offering high school credits and a credit-granting process, whereby mature students may obtain credit for prior learning. Another program service is the Dinowigehmin – Aboriginal Leadership Program (ALP), which is taking place this fall and is designed to contribute to the participant’s cultural, spiritual, mental, physical and emotional wellbeing. Please contact AETS to discover how we can assist with either training to employment or continuing education needs, be it via independent course study and/or scheduled class time (English or Math) and/or web-based courses. On behalf of the AETS Board of Directors and Staff, I am happy to report that the transition into Waverley was successful and we are excited about the upcoming delivery of training programs and related services as well as the washroom renovation which will benefit the whole community. Please visit our website at www.aets.org for details on our services and/or feel free to drop by in person to Waverley at 285 Red River Road on weekdays from 9:30 am to 4:30 pm or call us at (807) 346-0307. Some of the AETS Staff contacts available to connect with include, but not exclusive to the Elder in Residence, Employment Officer, High School Teacher, Job Development Officer, Life Skills Officer and Project (Pre-Apprenticeship Training Program) Co-ordinator. If you have a comment about today’s column, we would love to hear from you. Please comment below!